Monologue of a Connoisseur of Superfluous Verbiage: Can you balance the federal budget? My roommate pointed out today that the New York Times Freakonomics blog has a link to a really cool online game called Budget Hero. The premise is simple: you get to choose how the federal budget is divvied up. You play cards that send a little money to your favorite program, cut the ones you don't like, and raise or lower taxes in specific ways. If you haven't seen it, you should definitely check it out. It's not only entertaining, but it's also really informative. How did I do? Glad you asked. 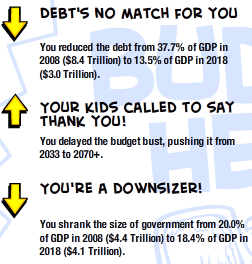 I reduced the debt from 37% ($8.4T) of GDP today to 13.5% of GDP ($3.0T) in 2018. I delayed the time when the government will run out of money to fund programs from 2033 until sometime after 2070. I shrank the size of the government from 20.0% of GDP today to 18.4% of GDP in 2018. I improved the budget from a several-trillion-dollar deficit today to a surplus of more than $6T in 2018. Cap and limit carbon emissions. Limit the Bush tax cuts to only the needy. Cut military spending by 10%. Climate change is a serious problem, and the U.S. contributes to it largely because carbon emissions are currently a negative externality. For those of you who slept through economics, that means that it's a bad effect that you don't have to pay for. Capping carbon emissions would solve two problems: it would limit the amount that goes into the atmosphere, and it would force people who are polluting to pay for it. I'm all for tax cuts, but not when the government is $37T in debt. I think that paying down the debt is more important than keeping a few more dollars in the rich's pockets. We've been playing a dishonest game of spending more than we make for a long time, and it's time to bite the bullet and own up. If you haven't played, give it a whirl. You might learn a thing or two. I sure did. I'd vote for you! Hey, I didn't realize you'd left a message on my blog. I finally checked it (and updated it) after forever. Sounds like you're having fun in California! I had to laugh at your description of the way Oregonians are taught to hate Californians - so true! Do you know the joke about the Oregonian who meets a Californian in a bar?